The ‘Orangecon’ fan event was held at Skylight Clarkson SQ. 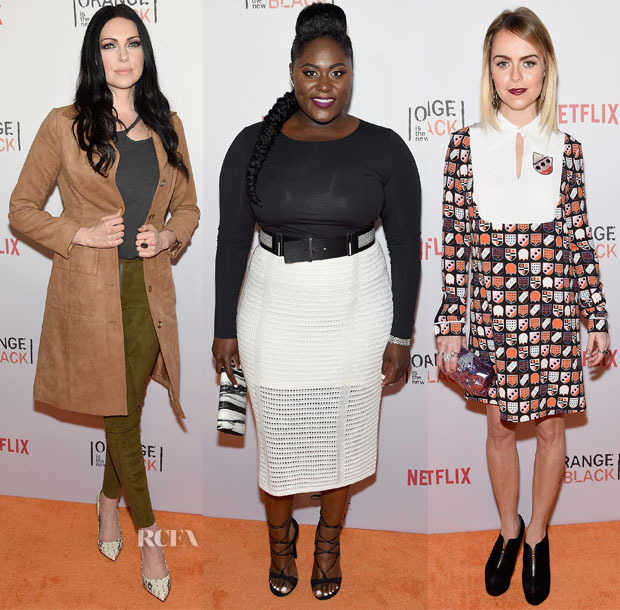 on Thursday (June 11) in New York City to celebrate season 3 of ‘Orange Is The New Black’. The stars of the hit show were out in force, swapping their orange jumpsuits for a selection of sizzling red carpet looks. Uzo Aduba: This was by far my favourite of the bunch. Uzo took my breath away wearing a Dee Hutton halter dress with a yellow leather fitted bodice and a floaty teal chiffon skirt. It wasn’t just the dress that excited me, as her hair, makeup and styling were on point too. Taylor Schilling: The actress wore a blazing red-hot Cushine et Ochs Pre-Fall 2015 dress, made all the more alluring with the cut-out details which she complemented with Ralph Lauren sandals. Breaking up the matchiness she styled her look with a gold Lee Savage ‘Broken Space’ clutch and Jennifer Meyer jewels; keeping the makeup neutral. Natasha Lyonne: The actress wore a Creatures Of The Wind blue coated mini amped up with white studded pumps. Laura Prepon: The actress is a huge fan of wearing black, so I was surprised to see her opting for shades of camel and olive on this occasion. Danielle Brooks: The actress stuck to classic black and white for her red carpet look. Taryn Manning: The actress may have worn a playful print dress, but added her signature vampy lip and heavy footwear were very much present.